At AEF, the ability to accept agricultural products is one of the ways that we are able to help donors use a non-cash asset to build a charitable legacy. The process is simple to implement, provided that the appropriate guidelines and steps are taken. The farmer can exclude the sale of the cash crop from income and deduct the cost of growing the crop. There is no deduction for a charitable contribution. Available for cash basis farmers. Farmers must engage in cash accounting. Crop share landlords cannot gift grain. Shares of crop are rental income that must be reported as income on their tax return. The farmer must give up “dominion and control” of the commodity. The farmer cannot sell the grain and order the proceeds to be sent to AEF. This would result in the transaction being considered a cash sale and cash donation since the farmer has not given up control of the property. The farmer should not provide guidance to the charity regarding the sale of the commodity. AEF assumes the risk after the transfer. These risks include storage, transportation and marketing costs as well as price risk. The transaction must be well documented to show AEF as the owner. Costs associated with growing the crops may not be deductible if those costs are incurred in the same year as the year of the donation of the grain. Therefore, gifts made from the prior years' unsold crop inventory may offer the best tax results. See your tax advisor to determine if this is the best course of action for your circumstances. Grain can be gifted at any time during the tax year. The gift should be from unsold crop inventory. No sale commitment should be made prior to the gift. AEF will retain the warehouse receipt and the original invoice showing AEF as the seller. The farmer completes the AEF Letter of Understanding - Requirements for Consideration and Acceptance of Crop Commodities and submits it to AEF. The farmer asks the elevator to transfer the donated bushels to AEF through the Crop Commodity Transfer Form. 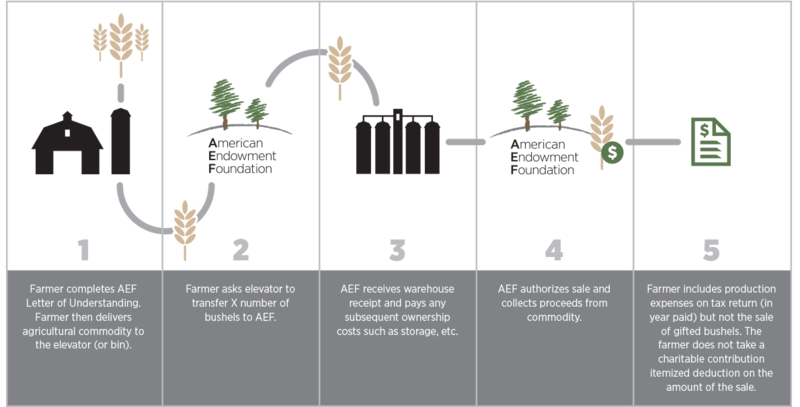 The farmer provides the warehouse receipt to AEF. AEF will authorize the sale at its discretion. The proceeds of the sale fund the farmer's AEF Donor Advised Fund. Questions? Contact us at 1-888-440-4233 and allow us to assist you through the process.